Charlene Patton is with the Home Baking Assn. in Topeka, KS and she demonstrated sculpting various types of breads and each one was made with the recipe below - Refrigerator Potato Dough. 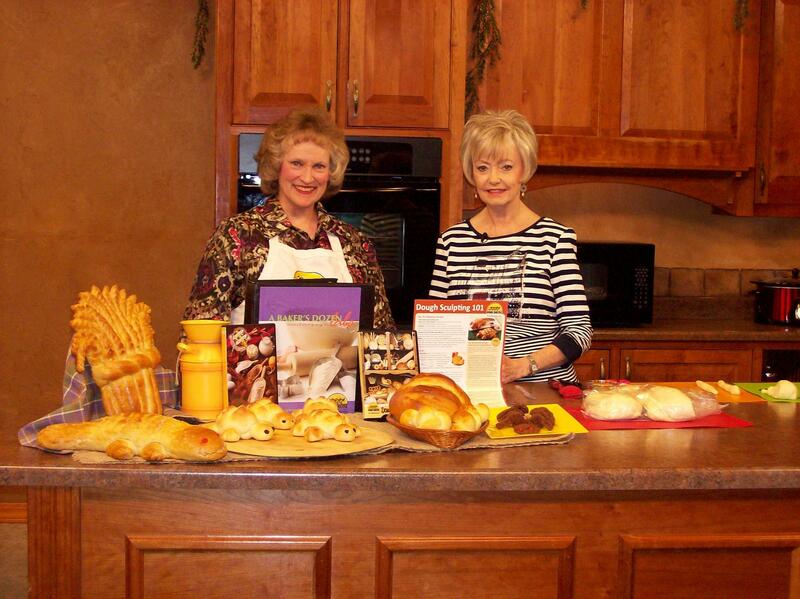 Charlene Patton demonstrates bread sculpting when she appears on "Creative Living with Sheryl Borden." Besides the rolls and bread basket, she also sculpted a turtle and an alligator! Preheat oven to 350° F for loaf or 400° F for muffins. Lightly grease 9x5x2 1/2-inch loaf pan OR grease bottoms or line 14 muffin cups. In a large mixing bowl, measure or weigh the first six dry ingredients. Blend well with whisk. In a second bowl whisk to blend well the sugar or agave nectar, grated carrot, egg/egg substitute, milk, melted butter, orange peel and vanilla. Add conditioned raisins and nuts or seeds to dry mixture. Make a large dip in the center of the mix; add liquid mixture. Stir together only until all the ingredients are moistened. Scoop batter into prepared loaf pan or muffin cups (filling 2/3 full). Bake loaf 45 to 50 minutes at 350° F or muffins 18 to 20 minutes at 400° F. Cool pan 5 minutes on wire rack. Turn loaf or muffins onto rack to cool, then wrap. Store one day at room temperature or freeze.